10 years ago, in 2006, Pure & Original was started by Erwin Floor. Erwin and his wife built their own house and their inspiration for this were Belgian, rural homes. These houses had beautiful walls! Intensive, dark colours, a smoothness factor and a beautiful grey flow and colour shade. After weeks of searching, this paint was found not to be available in the Netherlands. 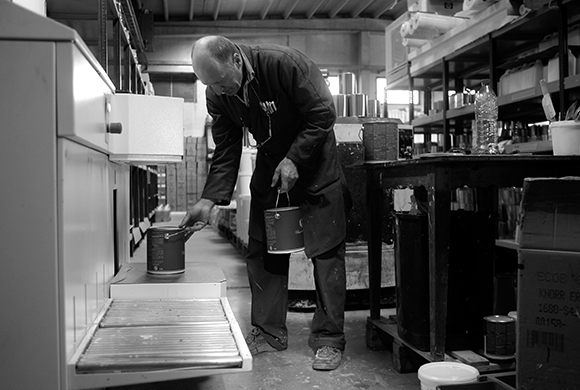 Until they came to contact a small factory in Belgium, that could fabricate the paint. So said, so done. A little later, the first pots did arrive and they could start painting. What a beautiful paint! And the first stripes with Pure & Orginal where a fact. Now, years later, the paint has been improved and expanded many times. Pure & Original now offers a wide range of wall paint, lacquers, floor paint, façade paint and specials as primer and sealer. The best-known items are the Fresco lime paint and Classico chalk-based paint, but the Marrakech Walls is working on it's way up with its unique concrete look. Thanks to this wide range, there is an appropriate paint for every room! The small factory in Belgium has to work hard to keep up with Pure & Original's big leaps forward. The beautiful products are currently available all over the world! Not only is the paint of Pure & Original beautiful, it is also durable. It is made with less chemical additives as possible, some paint qualities are even completely ecological. Perfect for kids and allergies! The Pure & Original paints are made with 100% natural pigments and contain no chemical additives. 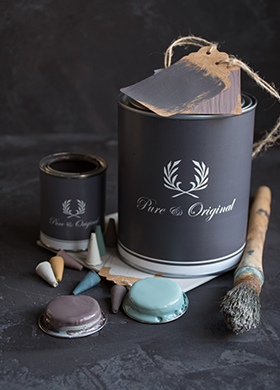 The Pure & Original paints are made with 100% natural pigments and contain no chemical additives.